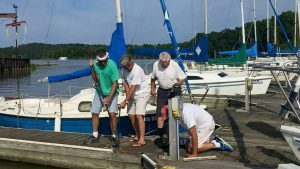 Social Dock Work Session 8/19/2016 1 pm. Have you seen the pictures from last weekend? Check them out on Facebook. We have the dock frames and floats in place, and are nearly ready to install the decking. building the dock decided to come back and finish it this weekend. With racing on Saturday before the BVI night, we are looking for volunteers to play hooky on Friday afternoon and help us get it finished. We are planning on meeting at Hanna Creek this Friday at 1:00 to finish the final bolting of the frames and installing the decking. Thanks again to those that have helped on each of our prior weekends. If you have not had a chance to help yet, you are more than welcome to join us for this final work session. Come whenever you can, as we will be working most of the afternoon. Or just bring a beverage to be among the first Club Members to toast our newest improvement to our home at Hanna Creek.